Joined Impact India Foundation from 1 March, 2001. 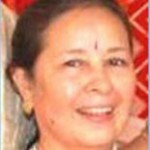 Neelam brings to the position much experience that helps Impact in its efforts for the prevention and cure of disablement. She has worked in various capacities in the fields of social communications, research, education and training mainly with Doordarshan, Tata Institute of Social Sciences (TISS) and the Aga Khan Education Service, India. Neelam is a Trustee of the Process Work Institute of India (psychotherapy and social action) and an activist with Action for good Governance and Networking in India (AGNI), mobilizing citizens from all classes towards civic action.